Star Wars: The Force Awakens is 21 days away from release. And as we get closer and closer to the big day, it's becoming nearly impossibly to avoid spoilers. The stars of the movie, both old and new, are starting to make the press rounds. And you can't pass a magazine rack in the grocery story without seeing a familiar face from that galaxy far, far away. 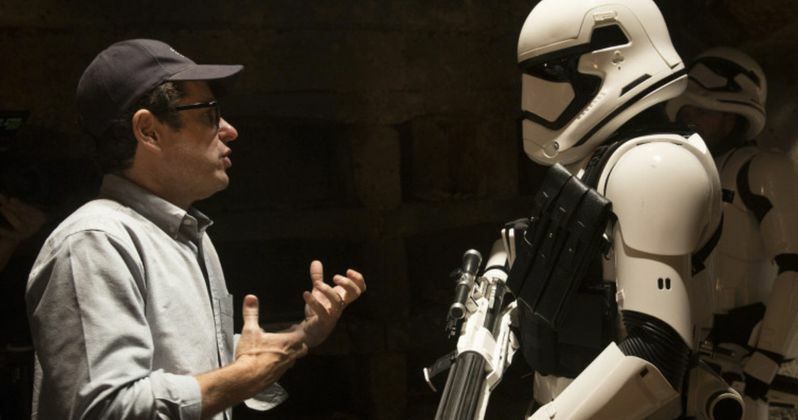 Today, we have some new intel into the making of the movie direct from J.J. Abrams himself. He offers some surprising films and directors that helped inspire the look and feel of his sequel. And he opens up about why the lighsaber battles seen on screen in Star Wars 7 are different than what has come before it. It has long been known that director J.J. Abrams and his crew are utilizing a look and style that is very similar to the original Star Wars trilogy. And that means a lot of practical effects, with CGI taking a backseat to prosthetics and actual sets this time around. But the filmmaker wasn't just inspired by A New Hope, The Empire Strikes Back and Return of the Jedi. Before he embarked on this three year journey in rebooting the Star Wars universe for a new generation, he dived into some unexpected films. And studied the 'confidence' on display in the Westerns made by legendary director John Ford. He also studied Akira Kurosawa's scene choreography and composition, which he describes as 'unbelievable'. Rounding out a trio of movie making mavericks and cinematic genius that helped fire the imagination behind The Force Awakens was Terrence Malick. His 'powerful stillness' will be on display in this upcoming Star Wars adventure. Says J.J. Abrams. "It's not something I would normally have thought of coming to Star Wars." J.J. Abrams decided to utilize a spare directing style, bringing a less-is-more aesthetic to his work. J.J. Abrams went onto discuss how this technique will be utilized in bringing the new lightsaber duels on display to life. Some fans complained that the sword battles seen in the prequel trilogy were a little too elaborate and choreographed. J.J. Abrams decided to take a raw, primitive approach this time around. Especially in the big fight between Kylo Ren and Finn, with the later not too accustomed to lightsaber fights. "When you look at Star Wars and Empire, they are very different lightsaber battles, but for me they felt more powerful because they were not quite as slick. I was hoping to go for something much more primitive, aggressive and rougher, a throwback to the kind of heart-stopping lightsaber fights I remembered being so enthralled by as a kid." The lightsaber duels in Star Wars: The Force Awakens will also harken to the original trilogy in that they will help service the story, and bring us into these characters psyches. They're not just action scenes for the sake of having an action scene. There will be a lot at stake for both participants. And because of that, should have a deeper impact on the audience. What do you think? Does this sound like what you were hoping for?